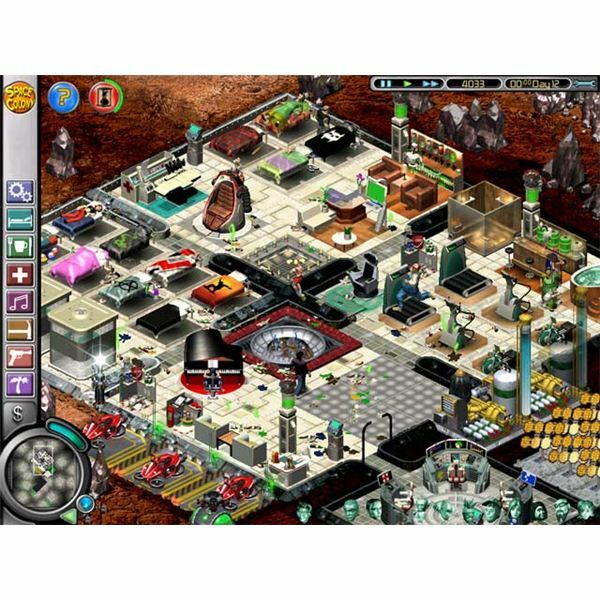 Space Colony is a real time strategy game which ties in elements of The Sims. It was released in 2003 and developed by the talented Firefly Studios, the same developers who created Stronghold. The basic setting of the game is a series of space colonies on alien planets which are inhabited by a number of dysfunctional crew members. 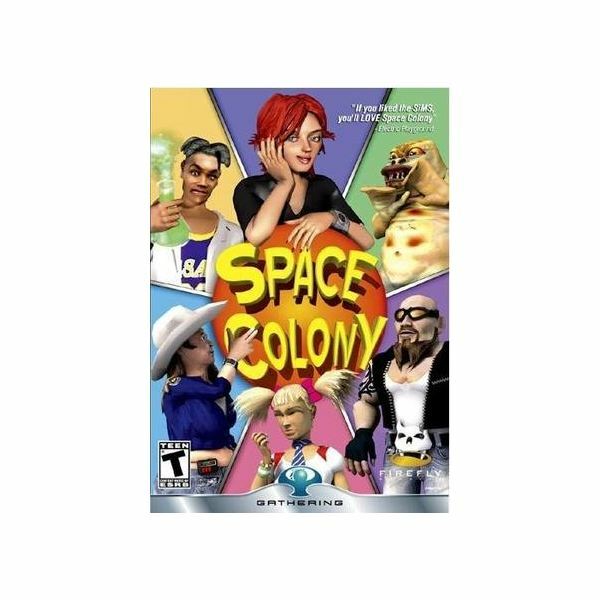 The player takes on the role of an overseer for evil futuristic company Blackwater Industries and must care for the crew and perform a series of tasks in order to progress to the next level. Sometimes you have to set up mining operations, sometimes tourist destinations and you run into hostile alien life-forms quite frequently. The focus is firmly on comedy and there is some great voiceover work in the game and some comical sci-fi references. The basic design is familiar RTS territory and you can select various buildings to construct from the simple fold out menu on the left of the HUD. You generally start each level with an existing base though it may be small or in disrepair. The colonists arrive by shuttle and you have to assign them to a bed and make sure you cater for their needs. Depending on the mission, you construct the buildings you need and order the crew to perform various actions, like mining or research. The missions start out fairly easy but the learning curve is steep and it won’t take long until you run into a mission which requires a restart to complete. In addition to dealing with your main mission objectives you also have to keep a close eye on your crew. While they occasionally cater for their own needs you will often have to tell them to go and eat or wash. It is also vital that you ensure their physical and mental health are cared for, if a crew member goes insane there is no telling what they might do! Each of the colonists has their own personality and they can form friendships by chatting but some of them have serious clashes and this can develop into violence if you don’t manage it carefully. The missions are split into two fairly distinct categories, economic and military. There is no doubt that the economic missions are easier to manage and better designed. The military missions often feel very chaotic and can be frustratingly tricky as the base comes under attack from fast moving alien swarms. There is no multiplayer option in the game but the sandbox mode adds replay value and you can choose campaigns focusing on economics or warfare depending on your preference. The sound is very well designed and in particular the voiceover work brings the various characters to life and gives the game a real immersive feel. There are twenty characters in all and each has their own lines of dialogue and responses to your orders. My favourite was probably Stig the Norwegian muscle man but there is also a fellow Scot in the game, the soccer mad Nailer McBride. The transmissions from your evil employers at Blackwater Industries are also nicely realised and there are references to classic sci-fi series like Star Trek and movies like Alien. 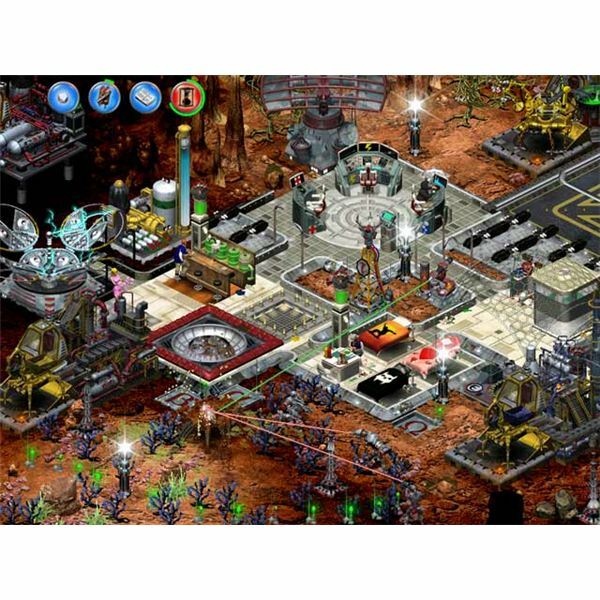 The game features a typical RTS isometric view and buildings are clearly delineated with a familiar grid. The art style is cute and cartoonish and while the environments are somewhat barren the interior of the base is colourful and well modelled. The aliens you encounter are mostly of the cute looking variety although they are often more dangerous than they look. The characters are also skilfully designed and have some personality to them, the animation is good and while the overall art style is not going to blow you away it hangs together well. This is a few years old now so the system requirements are nice and light. All you’ll really need is a 1.2GHz processor, 128MB RAM, 850MB of hard drive space and direct x 8.1 compatible sound and video card. It will actually run on an even more basic system (800 MHz processor and 64MB RAM) but not very well. This is unlikely to cause you any problems and I found the game ran very smoothly. This is a really enjoyable game and the mix of real time strategy and simulation style management works very well. The game-play can be frustrating at times and there are some tricky missions that may require a few attempts, there are also some weaknesses in the AI behaviour but ultimately none of the problems distract from what is a funny and challenging title. As I said before the economic campaign is more enjoyable and allows you to find a good balance between your various tasks whereas the military campaign often feels chaotic and a little too fast for my liking. This certainly offers something a bit new and for the most part it is well balanced, funny and worth your time.